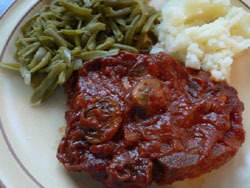 I thank my Father-In-Law, Nick, for this recipe for Baked Pork Chops. The flavors blend so well and served with mashed potatoes is perfect. Saute onions and mushrooms and set aside. In a medium sauce pan mix tomato sauce, water, cinnamon, allspice, salt, pepper, oregano, garlic powder, lemon juice, vermouth. Add onions and mushrooms. Simmer slowly for a few hours until sauce thickens. Brown chops and then place chops in 13x9 pan. Pour sauce over to cover chops and bake at 350 degrees for 45 minutes. Serve with mashed potatoes and your favorite vegetables. I like this dish with asparagus or french cut green beans.